Both varieties of Pork Rinds won taste tests in both US Wellness Meats’ test kitchens. They are also shelf stable and make a great on the go snack. 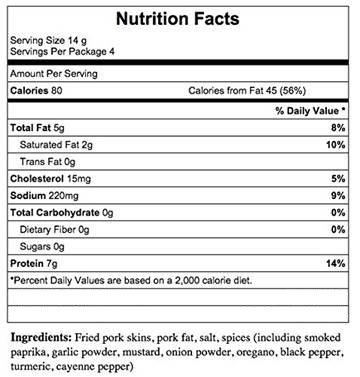 BBQ Spice Pork Rinds come in a 2 ounce resalable package. Do you only want Pork Rinds, but cannot checkout? Because Pork Rinds are non-perishable, US Wellness Meats can waive the minimum 7 pound shipping weight. However, the $75 order minimum will still need to be met. The online system is unable to bypass the minimum order requirements, you may call our office at (877) 383-0051 to complete an order. If perishable items are combined on the same order as Pork Rinds, a minimum of 7 pounds of frozen weight is required to help ensure items arrive in good condition. The shelf life of Pork Rinds is 9 months stored at room temperature and 1 year stored in the freezer. I often add these as a little treat when I do my monthly order. The BBQ spice flavor is mild and kind of herb-y, not hot, and also not sweet. I love the crunch of the pork rinds. They are better and fresher than the ones you can commonly get at the supermarket, and since they are fried in the same lard US Wellness sells, more trustworthy as far as being additive-free goes. I was in love with these BBQ spice pork rinds the instant I tried them! The spices are perfect, and I love that they are fried in pork fat instead of seed oils or other rancid oils. I order them every time I place an order with US Wellness Meats. Try them--they are nothing like the ones you buy in the stores! The taste is dry and bitter due to too much either paprika or chile powder. It just tasted 'off' maybe needs a little salt to round out the flavor. Thank you for taking the time to review our product! We are truly very sorry for the disappointment. We have not experienced any similar complaints as this seems to be a crowd favorite! We realize that our products will not always be for everyone. We greatly appreciate all feedback, good and bad as it is what allows us to grow as a company and become better for our customers. We recommend trying our Original Pork Rinds or our Salt and Pepper Pork Rinds in the future. They are great to have around when the craving for a salty/crunchy snack hits. Unfortunately, because they are so good, they never last long in my household. I never liked pork rinds until i tried these BBQ ones!! I am addicted!! The flavor is great!! Can not wait for them to be back in stock!! So good!! I really disliked these, but that could be a personal preference thing. Left me feeling a little ripped off. I know is says 2oz but I guess I didn't actually expect to get just a small bag of snacks for $6. Other than that, the flavor was pretty good, heavy on some of the spices, a little too light on sea salt but over all nice to have the option at least. If this was an economical purchase I'd buy them again and often. *From USWM: Thank you for your honest feedback. We're very sorry for your disappointment with the portion size - we make every attempt to be very clear in our detailed product descriptions regarding package weights.